The European Commission issued new guidelines Tuesday which could end costly and controversial subsidies for renewable energy, opening the way for state-aid backing of gas or coal-fired electricity generation projects. 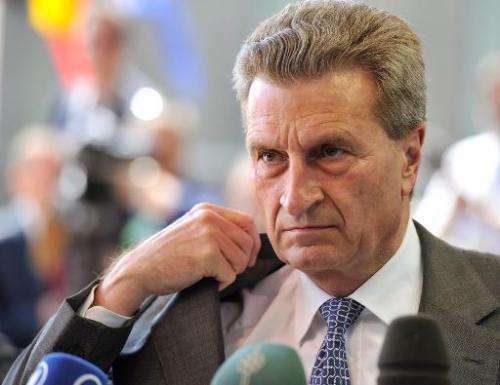 "The ultimate aim of the market is to deliver secure and affordable energy for our citizens and business," EU Energy Commissioner Guenther Oettinger said. "Public intervention must support these objectives. It needs to be cost-efficient and be adapted to changing circumstances. "When the sun is not shining and the wind is not blowing, electricity must still be produced," Oettinger's statement underlined. To ensure back-up generating capacity, new power plants would be needed, and these could get state backing. State intervention is potentially harmful to the working of the market and the new guidelines are meant to prevent that and show member nations what "best practice" is. Accordingly, the Commission will now "consider whether to propose legal instruments" to ensure the new recommendations to member states' governments are upheld. The guidelines meet a demand by some member states, including France, for extra capacity to be provided by "coal and gas power plants which are flexible enough to be turned on and off whenever needed". The Commission said investment costs in renewables have come down and therefore government support can now be tapered off. It warned that "governments must avoid unannounced or retro-active scheme changes" while the guidelines also stress that back-up capacity should meet European-wide needs, not only requirements in national markets. However, Oettinger's office said state-aid for nuclear generation was not yet acceptable—a key issue for many and especially Britain which has just announced its first nuclear plant for a generation to be built and financed by French and Chinese energy giants. Big energy firms from a host of countries including GDF-Suez, Eni and E.ON and RWE, have urged that state-aid advantages be removed from removables such as solar and wind energy. The European Union is committed to climate and energy targets that can deliver by 2020 a 20-percent reduction in greenhouse gas emissions—blamed for global warming—with a 20-percent share for renewables in the EU energy mix.